Spokane Police Chief Frank Straub speaks with reporters and TV crews Wednesday afternoon. 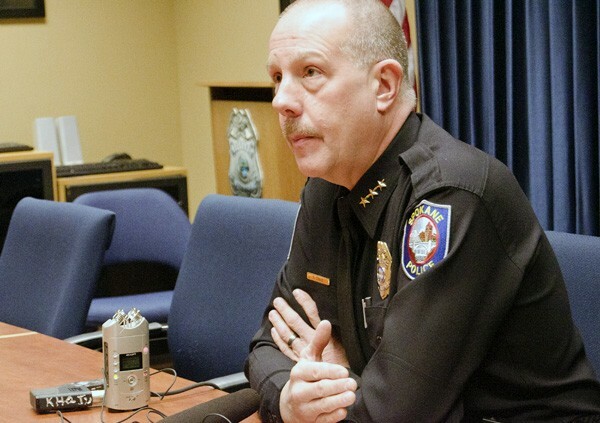 In the wake of a violent New Year's holiday weekend, Spokane Police Chief Frank Straub today called for increased community responsibility in partnership with new policing strategies focused on undermining violent crime. With investigators working multiple shootings and one robbery involving an ax, Straub says the recent uptick in violent crime is "unacceptable." The chief counted seven homicides citywide in the past month, matching seven homicides in the previous 11 months of 2012. "We're not happy with the increase in homicides," he says. Spokane police officers responded to two separate shootings in North Spokane overnight on New Year's Eve. One person was killed and two others were wounded. Detectives continue to investigate a recent drive-by shooting along with a fatal handgun discharge at a party that killed a 20-year-old woman last week. Department records show last year's 14 homicides far outpaced the four homicides in 2011, which was below average. Records show seven homicides in 2010 and eight homicides in 2009. "It's indicative of several problems," he says. "It's gang activity and there's some level of drug activity." Straub, who took over the department last fall, says his recently released 2013 Strategic Plan will focus resources on identifying criminal hotspots and targeting people responsible for driving violent crime. He says the department plans to partner with federal agencies and code enforcement to crack down on gang activity. "Anybody who's participating in a gang in Spokane needs to know we're coming after them and we're coming after them with a vengeance," he says. "We will not tolerate gang-related crime of any sort." The chief also called on the public to report neighborhood disturbances, quoting the popular "If you see something, say something" slogan. He encouraged citizens to call the police if they notice large disputes breaking out or see dangerous behavior. He says some recent incidents have escalated from arguments to shootings very quickly. "Not just here, but nationally we're settling too many disputes by shooting each other and we're killing ourselves," Straub says. "I think it's a serious problem. … If you go to a party and someone has a gun — go home." In the wake of the killings, Straub says reducing gun crime should be part of a larger national conversation about personal responsibility and public safety. He says the country has to re-evaluate its morals to confront the roots of violence. "I think it's a scary statement about where we are as a nation," Straub says. "We settle arguments now by going from zero to 100. We take out a gun and shoot people. That's unacceptable behavior." Despite the recent increases in violence and property crimes, Straub remains optimistic new community policing strategies, improved crime tracking and neighborhood cooperation will help stem homicides and other crimes in the coming year. "You're going to see Spokane be one of the safest mid-sized cities in the United States," he says. "That's my commitment to the community. … We're not going to tolerate another weekend like this."